The barrel sponge is barrel shaped with a rough exterior that is very hard in texture. They can reach a diameter of up to 2 meters and can live as long as 100 years. They range in color from shades of brown, red and purple. Spongin provide support for the organism. They possess no organs, but are able to draw water into their bodies through the use of ciliated cells in order to entrap food. Reproduction can either be sexual or asexual depending on environmental conditions. 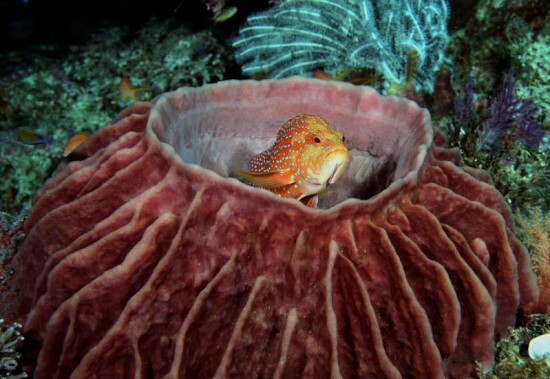 Barrel Sponges can be found inhabiting mid-range to deep coral reefs and muddy sand bottoms in deeper water. They are distributed at the Bahamas, Caribbean and Florida. The barrel sponge has no known importance to humans. "Giant Barrel Sponge". Marine Species Identification Portal. Retrieved from: http://species-identification.org/species.php?species_group=caribbean_diving_guide&id=476.